Another great shot of the bride and groom’s wedding rings. The wedding bands are just one of the many little details that the couple chooses when they pledge their love for one another eternally. This is the one piece of jewelry you will wear everyday for the rest of your life so careful attention is given when choosing it’s style, material and adornment.So many details go into making up the theme, feel and look of your wedding day. Invitations, rings, flowers, shoes, gowns, dresses, tuxedos, formal wear, favors, linens, chair covers, lighting, centerpieces, menus, signs, decorations, food displays, cakes, cake toppers, entertainment, food selections, etc, etc. It is not the job of modern, contemporary wedding photographers to simply create wonderful bridal portraits and capture all of the candid, spontaneous moments of your wedding day. Today’s wedding photographer must be a master of the details as well, and creatively photograph them to preserve them forever.This particular shot of the couple’s wedding rings requires some specialized equipment as well as some advanced photography skills. I carry 3 Nikon cameras and a 105mm Micro Nikkor lens on every job. This Macro lens is used solely for capturing extreme close-up shots of small items such as the couple’s wedding bands. Most of today’s new breed of photographers won’t make the financial commitment to add such a specialized expensive lens to their arsenal, opting instead to use a normal lens and rely upon post-processing in Photoshop to "zoom in" on the rings. This is an inferior way of executing a shot like this and the results will never show the minute little details of the rings like you are seeing here. 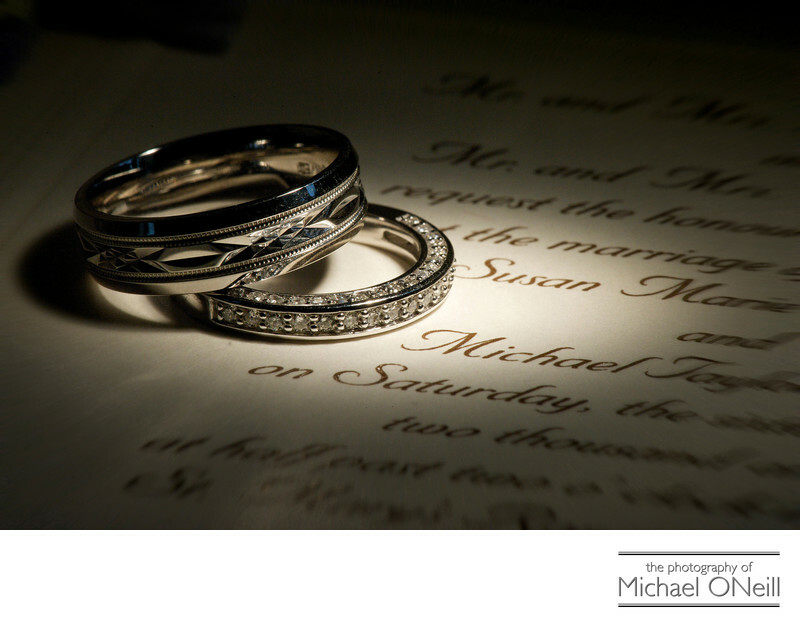 To execute this shot I also carry small tungsten light sources that focus the delicate lighting right where I need it to be on the rings and the wedding invitation that they are lying on. My highly-skilled assistant knows exactly where to point and focus these lights to create the natural looking light streaming across the invitation and illuminating the rings. A lot of the new breed of wedding photographers will not make the financial commitment to acquire all the photographic tools necessary to make the best of your wedding pictures. Nor do they take the time to research and practice the techniques required to execute elegant images like this. Finally, they don’t hire skilled assistants who are not only responsible for making the photographer’s work look as good as it possibly can, but are also responsible for helping me move about 70 pounds of equipment from location to location throughout the wedding day.If you are interested in working with a wedding photographer who has devoted his entire life to making better pictures, and who has assembled all of the equipment, knowledge and human resources to assure that nothing but the best gets delivered to you, give me a call. I’d love to put all of my assets to work for you to create the greatest wedding photographs ever.